Light has always been an integral part of how we interact with the world, defining how and when we go about our lives. Artificial lighting completely altered that relationship: no longer reliant upon sunlight to see, humans could effectively function at any time of the day. However, our increasing ability to control our environment is not without consequence, making it is easy to forget the role that natural light has played for millennia in defining our circadian rhythms, or what is more commonly known as our internal body clocks. 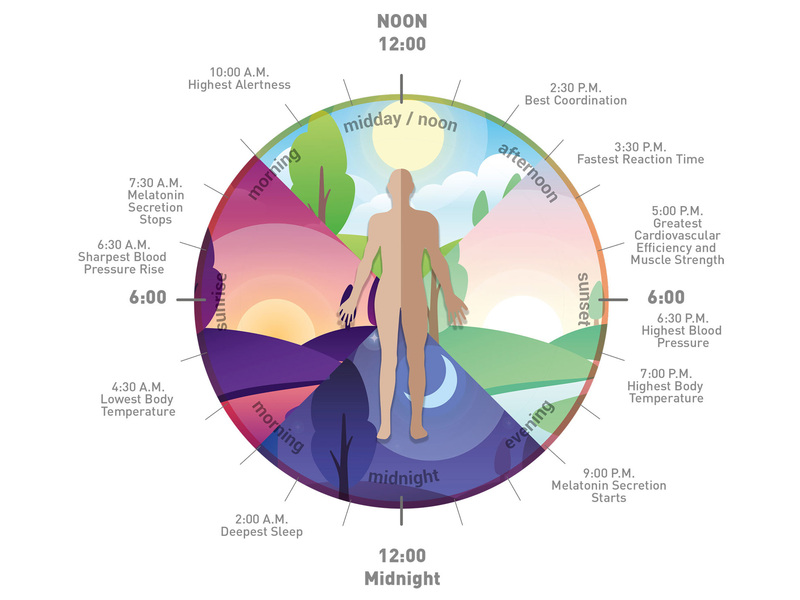 Our circadian rhythm defines when we feel awake, alert, relaxed, and tired, but also impacts our visual acuity, productivity, performance, stress levels, blood pressure and body temperature based on our biological responses to the amount and colour temperature of the light present in our environments. Until only recently, artificial lighting was a fairly static decision, with predetermined colour temperatures ranging from a more calming warm white to cool light, which keeps us alert and is closest to the natural light available in the middle of the day. These decisions, being the most common choices in our offices, hospitals and schools, can align with our internal body clocks at certain times of the day, but clash during others. Occasionally this can be useful, such as when trying to concentrate on a task late at night. However, in other instances, long-term exposure to the wrong types of light can have detrimental effects on our bodies and biological responses. Human Centric Lighting (HCL) takes advantage of contemporary technology to introduce a more socially sustainable approach to lighting systems. These systems take advantage of controllable lighting technologies, more readily accessible thanks to the widespread proliferation of LEDs, to evoke human biological responses in support of our health, wellbeing, and performance. In offices and schools HCL systems can improve learning, concentration and performance, as well as improve efficiency and accuracy in work, promote better sleep and reduce absentee rates. Furthermore, HCL can enhance patient comfort in hospitals and aged care centres, encouraging the cognitive function and health of aged patients by assisting their natural circadian rhythm, as well as reducing the fatigue of hospital staff at night. HCL systems, effective at any scale of installation, can be programmed on a schedule, with occupancy-based control, and with personalised control, creating an intelligent lighting environment that is capable of both cutting back on energy without compromising light quality, user comfort or safety, as well as maintaining desired lighting levels and qualities throughout the day. Light level sensors can also take into account existing daylight levels and adjust luminaire output accordingly, seamlessly facilitating a range of activities according to personal preference or the task at hand. Recognising the importance of HCL in promoting social sustainability in our offices, schools and hospitals, industry leader Gerard Lighting now offers tuneable troffers that can support the desired outcomes from HCL systems, such as GenLED and DLED (tuneable from 2700k to 6500k), and Scriptus (from 3000k to 6500k). They can also be used for projects attempting to achieve WELL standard accreditation, which specifies guidelines for lighting focused on social sustainability, including minimising the disruption to the body’s circadian rhythm by artificial lighting, enhancing productivity, promoting proper sleep and providing appropriate visual acuity.